The Philadelphia Flyers travel to Gila River Arena to play the Arizona Coyotes on Saturday, March 26, 2016. The opening line for this game has the Flyers at -125 and the Coyotes at +113. The over/under has been set at 5. Philadelphia comes into this matchup having played 73 games. They have an overall record of 36-24-13 and on the road they have a record of 17-14-6. Currently they are 5th in the Metropolitan Division. They've scored 192 goals and given up 195 goals for a point differential of -3. The Flyers have 13 overtime losses including 8 of them in a shootout. In the past 10 games they have an overall record of 7-1-2. For the season they have an ATS record of 36-37 and an over/under record of 29-26-18. Arizona shows up with a record of 33-34-7 including 20-14-4 at home this season. They are 4th in the Pacific Division. They've scored 195 goals and surrendered 220 for a goal differential of -25. The Coyotes have 7 losses in OT and 1 of them occurred in a shootout. They have a record of 6-3-1 in their last 10 contests. Their record against the spread is 33-41 while their over/under record sits at 34-32-8. Claude Giroux has accumulated 62 total points this season for the Flyers. He has 21 goals this season with 215 shots on goal giving him a shooting percentage of 10%. He has a total of 41 assists on the season and averages 21 minutes played per game. Wayne Simmonds has averaged 17 minutes of ice time per game this year. In that time he has a shooting percentage of 13% by scoring 25 goals on 198 shots. He has 26 assists giving him a total of 51 points on the season. Steve Mason has 19 wins and 16 losses this season in net for the Flyers. He has had 1,384 shots against him and has given up 113 goals. He has made 1,271 saves for a save percentage of 92%. 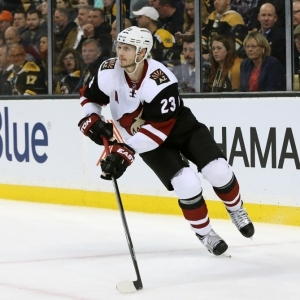 Oliver Ekman-Larsson has accumulated 51 total points this season for the Coyotes. He has 19 goals this season with 211 shots on goal giving him a shooting percentage of 9%. He has a total of 32 assists on the season and averages 25 minutes played per game. Max Domi has averaged 16 minutes of ice time per game. In that time he has a shooting percentage of 13% by scoring 18 goals on 143 shots. He has 29 assists giving him a total of 47 points on the season. Louis Domingue has 15 wins and 16 losses this season in net for the Coyotes. He has had 1,090 shots against him and has given up 91 goals. He has made 999 saves for a save percentage of 92%. The Flyers have 85 total points this season. They have scored 190 goals while giving up 187 goals. They have had 249 power play opportunities and have scored 45 goals on those chances for a percentage of 18%. The Flyers have allowed 242 power play opportunities and given up 46 goals on those chances for a penalty kill percentage of 81%. They average 31 shots per game and as a team are shooting 8.50% for the season to this point. They allow 31 shots to their opposition per contest and have a team save percentage of 92%. The Coyotes have a total of 73 points on the season. They have 50 power play goals on 275 opportunities thus far for a percentage of 18%. They have allowed 268 power play opportunities and have given up 58 goals on those chances for a penalty kill percentage of 78%. As a team, the Flyers have a total of 194 goals scored while they've given up 219 goals to this point. They average 28 shots per contest and have a team shooting percentage of 9.38%. As a team they give up 31 shots per game and have a save percentage of 91%. Philadelphia has a Corsi percentage of 50.3% as they've attempted 4,307 shots on net at full strength while they've given up 4,251 shots on net in the same situations. Their Fenwick percentage is at 50.3% as they have 3,129 attempts while they've given up 3,086 shots on the defensive end. The Flyers start possessions in the offensive zone 50.8% of the time while their defensive zone percentage is at 49.2% for the season. They have 2,221 face off wins compared to 2,171 losses, meaning their faceoff win percentage is 50.6%. On defense Philadelphia has 1,996 hits and they've blocked 1,165 shots from the opposition. Arizona has attempted 3,948 shots at full strength and they've given up 4,295 attempts, meaning their Corsi percentage is at 47.9% for the season. In terms of Fenwick percentage, they currently are at 47.3% as they have 2,932 shots while they've given up 3,266 attempts on defense. The Coyotes have an offensive zone percentage of 49.8% and their defensive zone percentage is 50.2% so far this season. They have a faceoff win percentage of 54.4% as they've compiled 2,506 face off wins this season and they have suffered 2,101 face off losses. On defense Arizona has blocked 1,029 shot attempts and they have 1,648 hits as a unit.